A Delicious blend of Guatemala Antigua, Colombian Supremo, and Fancy Bourbon Brazil Santos. A rich taste with a mellow body. 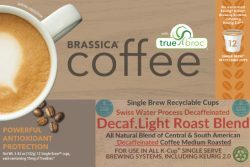 Each recyclable cup contains 15mg of truebroc branded glucoraphanin. A Delicious blend of Guatemala Antigua, Colombian Supremo, and Fancy Bourbon Brazil Santos. A rich taste with a mellow body. Each recyclable cup contains 15mg of TrueBroc® glucoraphanin, a long-lasting antioxidant from broccoli that helps to support your detoxification system. 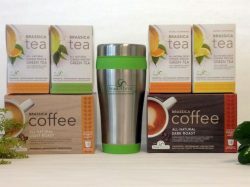 Each box contains 12 Recyclable Single Serve Cups. Works in all K-Cup® Brewers, including Keurig 2.0®.